OPI "It's Totally Fort Worth It"
*I apologize for the terrible lighting. Paint the base coat Tiffany's blue and allow it to dry. Using the largest end of a dotter tool and grey polish create several dots close together. Do it in a curve or a "U" shape. Using the smaller end of your dotter and white polish, create dots within the grey dots. Create short lines that connect the circles to resemble links. Next, find images of charms you want to replicate. Use the grey polish to create the "body" of the charm, and use white for any areas that would need high light. Use the silver polish and fill in the body and highlight areas to give it more dimension. Leave parts of the grey polish untouched so that it would resemble the low light of the charm. Finish the design off with details, such as embellishments (glitter flakes and white dots in between) and shadows (dip toothpick in black polish). I think this design looks better from afar. 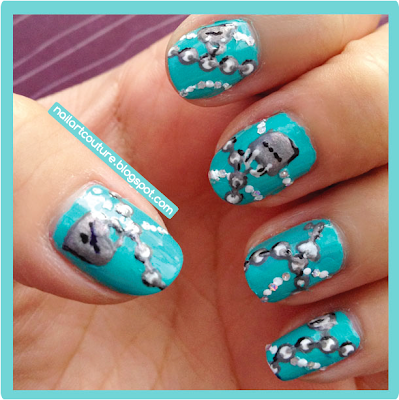 But I hope you enjoy this nail art tutorial! Please share it with your friends if you like it! so creative love ur inspiration. This is so cute and different! Well done on the detailing! Thank you hun! :) Following back! This is so cute! all your nail designs look awesome! Ooooh, so pretty, what a great idea! Visiting from Mani Monday,meant wait for more manis! @DSK Steph - Thank you Steph. Have you encountered a favorite yet? This is so creative; I’m wondering how you got this super cool idea. You are an interesting person.